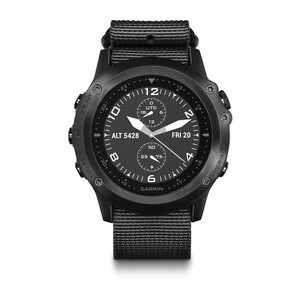 Garmin International Inc., a unit of Garmin Ltd., announced the tactic Bravo, a GPS sport watch that combines tactical training features and outdoor navigation with smart functionality. Featuring an all-black, rugged design, tactix Bravo was built for the tactical environment with a scratch-resistant domed sapphire lens, as well as a sunlight readable dual mode display that also allows night vision goggle operation. Additionally, it comes preloaded with specialised software for both aerial and land missions. Complete with sports training features, smart notifications and Connect IQ compatibility, tactix Bravo is also a great timepiece to wear every day. Inspired by the requirements of Law Enforcement and Tactical Units and able to handle the roughest conditions, tactix Bravo has a domed sapphire lens and a knurled bezel to prevent nicks and scratches. It has a stealth, all-black finish of diamond like carbon coating and the colour display has a special mode making it compatible with night vision goggles. tactix Bravo comes with watch bands made of ballistic nylon in black and olive drab. The nylon bands can be easily interchanged with no tools required, so users can easily switch between the black and olive drab. Boasting an EXO™ antenna and high-sensitivity GPS with GLONASS support, tactix Bravo has a comprehensive toolset to handle tactical training, exploring, missions and more. Users on land can mark and store up to 1,000 waypoints, navigate back to their starting point using the TracBack® feature, while users in the air can utilise the Jumpmaster software for three jump types: HAHO, HALO and Static. It also has a dedicated tactical activity profile with dual-position mode that can simultaneously display two sets of coordinate systems on a single data screen. Able to last through long missions or training sessions, tactix Bravo can get up to 50 hours of battery life in UltraTrac™ mode, 20 hours in GPS training mode, and up to three weeks in smartwatch mode. tactix Bravo boasts advanced workouts and training modes so athletes can get real-time performance data such as distance, pace, calories burned. Additionally, athletes get advanced running dynamics such as stride length, ground contact time balance and vertical ratio plus physiological measurements such as lactate threshold, stress score and performance condition1. tactix Bravo is also compatible with other ANT+ sensors2 to collect more data including temperature with Tempe™, or to control a VIRB® action camera remotely. tactix Bravo users will also have access to new activity profiles for golf, SUP and rowing. With the recently updated Garmin Connect mobile app, users can download more than 40,000 worldwide golf courses for precise course data and use their watch as a digital scorecard. With the new SUP/Rowing mode, users can measure their paddle stroke count, stroke rate and distance per stroke to gauge their efficiency. With daily activity tracking and connected features, tactix Bravo doubles as an everyday smartwatch. Users can track their daily steps, mileage and sleep, then wirelessly upload all their data to the recently updated Garmin Connect™ mobile app. They can also connect their watch to a compatible smartphone for call, text and email notifications right on the watch. Additionally, tactix Bravo is Connect™ IQ compatible, so users can customise their watch with a variety of watch faces, data fields, widgets and apps. The tactic Bravo will be available in Q1 2016 and will have a suggested retail price of £549.99.